After a brief barrage of artillery both sides quickly realized that the walls and towers were much too strong for the small amount of catapults that the crusaders had brought overseas. So, after a fortnight's labor, the besieging army constructed movable towers and ladders to scale the walls of the castle. The well-trained, iron-clad knights of Loreos fearlessly charged towards the enemy walls! Arrows, war-cries, and screams filled the air as the ladders were thrown in place. Meanwhile, the great siege towers rumbled their way forward. The defenders' arrows and javelins were useless against such machinery. 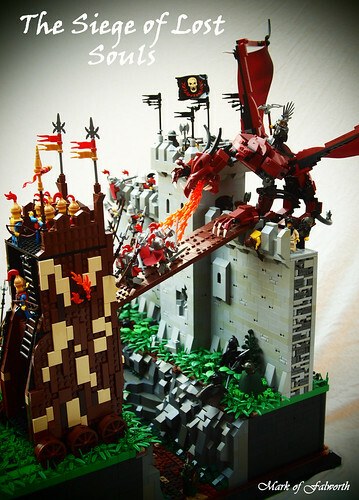 Just as the siege tower bridge slammed onto the parapet, and the victory of the crusaders seemed certain, lo and behold, a mighty dragon swooped in and crashed onto the wall. 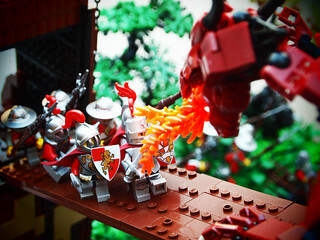 It spewed a searing hot stream of flame right into the astonished knights! Taken by surprise, the knights nevertheless dauntlessly resumed their charge, straight towards the ferocious beast! In this siege of Lost Souls, who shall prevail? This was so fun to make! I haven't built a big siege in a while. See more pictures on Flickr. Dude- great work! I have been watching your building for quite awhile and I honestly can say that you get better all the time. this is diffidently my favorite MOC of yours so far! this is wonderful! I love the walk way from the seife tower and the interior part of the wall. The attention to detail is awesome. I feel like, especially the wall part, is easily overlooked and just made a sheet of gray. I like how it looks like the stones that would have been inbetween the wall. The dragon is excellent, love the greebly things on the castle. Lovely! I love this. Amazing, but what else would I expect from you, other than perfection? That wall has not diminished in awesomeness with time, brilliant design. Totally agree. That detail is probably my favorite part of the whole thing (not that the rest isn't also awesome). One question: what's the skull flag from? Thanks! The flag is from the POTC Queen Anne's revenge set. Great job! Very nice rubble in the castle walls. The trench is great, too. 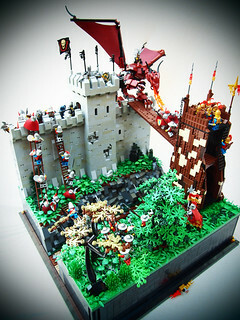 Wow, that castle wall is really great with that battle damage. so much detail and variety in building techniques !! looks like the siege tower will be up in flames pretty soon!